Rebounding exercise which is also called cellular exercise involves all parts of the body. The therapeutic movements on the mini-trampoline is considered superior to other regular exercise since it also enables removal of toxins and absorption of nutrients at the cellular level to convert them into energy. Besides increasing oxygen delivery and blood flow, rebounding exercise improves mind-body unity thus promoting learning, intuition and balance of the two hemispheres of the brain. Blockages in any system can create imbalance and sickness. These blockages are removed by rebound exercise and the blood flow is returned to the affected parts. Homeostasis, a condition of general balance of all the systems is created while doing this cellular exercise. The mini-trampoline used for rebounding exercise is about 3' in diameter and 9" high. Travelers can make use of the foldable models available in the market. The trampoline is safe while it is also being effective. Starting from health bounce, one can gradually move to strength bounces and aerobic bounces. Health bounce: One does not have to leave the mat for this bounce. The mere up and down movement improves the lymph flow in just two minutes. Various benefits like improved vision, mind-body balance are reported with this rebounder exercise. Strength bounce: Maximum oxygen absorption is the benefit of this bounce. All the reflex points on the feet are stimulated while landing after the bounce. Here one has to leave the mat for the bounce. Aerobic bounce: One can incorporate various bounces like jogging, sprinting, twist, kick legs and crisscross legs and arms and curling legs. The heart rate goes up while moving vigorously on the trampoline for about 20 minutes. One can add diaphragmatic breathing with this to accomplish better benefits. Using buddy bounce, one can help an invalid to experience the fun of bouncing on a trampoline. There are sitting bounces like V-bounce that strengthen the legs and abdominal muscles. V-bounce done in a sitting posture is effective for those who cannot stand up. While exercising with the mini trampoline, the body is subjected to gravitational pulls. It is zero at the top of each bounce and can be twice or even thrice that of gravity at the bottom according to the person's ability to rebound. Rebounding affects every joint and cell evenly when compared to jogging on hard surfaces that exerts lot of stress on joints like ankles and knees and thus damaging them. People start with 'health bounce'. Wearing running shoes is advisable but rebounding with bare feet is also good to avoid slips. An adult can start with rebounding for five minutes everyday and gradually increase the time as fitness improves. Reducing the duration to two minutes, an elderly person can do this exercise more times with a time gap of half an hour in between two sessions. The only contra-indication to rebounding reported in the case of older people is prolapse of organs. The connective tissue holding the internal organs in place takes time to get strengthened and so seniors should start the rebounding exercise gradually. Even blind or handicapped people can use mini-trampoline with an attached hand rail or stabilizing bars. Rebounding can be practiced by anyone who finds some time for exercising during the day. The springs on the mini trampoline are longer and hence the moves are easier and gentle on the joints. An increase of lymph flow by 15 to 30 times is reported during vigorous rebounding exercise. The channels carry the lymph fluids through their one-way valves and the fluid moves only in one direction. The lymph vessels normally run up the legs, arms and torso, but down to the neck from the face. Hence the pumping of lymph fluid is taken care of by the vertical up and down movements of rebounding. All internal organs are stimulated by the rebounding action. Many immune cells in the intestines like T-lymphocytes and macrophages that are self-propelled by amoebic action contain molecules similar to cells in muscle tissues. Because of the increased gravitational force during rebounding, all cells in the body grow stronger. The self-propelled immune cells become more active protecting the body against viruses, bacteria and cancer. The immune system is thus strengthened by the rebounding exercise. Rebounding increases the capacity of heart and lungs. Muscle tone pertaining to legs, thighs, hips, abdomen and arms improves. Balance and co-ordination is improved. Both the immune and lymphatic systems get a boost. Though the trampolines are not very expensive, it is better to go for models that provide adequate cushioning and good support. Four leg models seem to be cheaper but a six leg design is more stable. For easy storage facility, buy models that have legs that can be dismantled. Models with solid spring system ensure proper support to the joints. Buy a non-slip mat to safeguard against some difficult maneuvers. You can experience a feeling of weightlessness when exercising with a rebounder trampoline which is exactly the opposite when you pound on a treadmill. 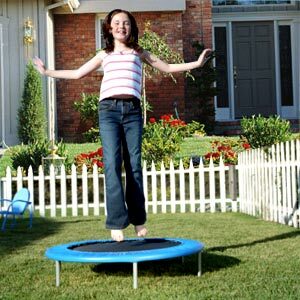 The cost of a mini-trampoline is just around what you pay for one month's membership in a local gym. Rebounding can be done at your own place and pace. First Published Date: 29 Aug 2006 Last modified Date: April 25 2019 This page may have been updated recently as new information is available or the content may have been edited for better readability.